Concrete might seem like a difficult material to craft with, but you can actually make very decorative and functional things with it — like this sturdy bookend that was part of an award-winning entry for a concrete crafts challenge. Sometimes the simplest designs are the most clever. DIYer Benita Larsson of the Chez Larsson blog made this bookend (as well as six other items) out of concrete and an oil-coated Ferrero Rocher container. The initial on the front was made by placing an MDF letter in reverse in the mould. A bookend is a smart choice for the concrete challenge, since you want a bookend to be strong. Benita writes in her blog that the bookend weighs about 3 pounds, but you could make a thinner version or otherwise adjust the size for your needs. Of course, you're not limited to using your initials only. If you organise your books by author name, as I do, you can use a couple of these to create sections on your bookshelves. Or unleash your creativity to discover other ways to use concrete in your home (like making a concrete desk). 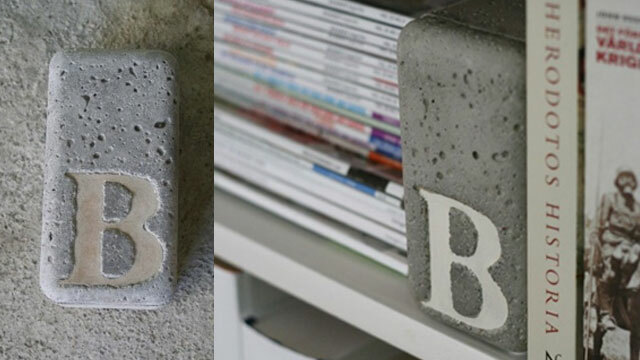 Got any concrete project or cool bookend ideas? Share them with us in the comments.